Exercise Compliance: Improving Exercise Compliance in Chronic Back Pain Patients Using a Pocket Diary. This article examines the question of how to improve rehabilitation exercise compliance. This is particularly important for patients who are recovering from chronic back pain who have lost the discipline of regular activity. Assuming that the prescribed exercises are not unduly painful, the question is not “how do we help people to exercise more”, rather it is “how do we help people to develop self-discipline”. Evidence from other industries demonstrates that setting goals and keeping a diary of the new habit is the most effective way to maintain self-discipline to arrive at a goal. I propose the use of pocket diaries as a key tool to improve rehabilitation exercise compliance for people with chronic back pain. How many clinics just give their patients a set of printed or hand written exercise instructions and essentially leave it to the patient to get on with it … or not? I hear it all the time, patients don’t do their exercises. Patients are people, who are also in pain. Think of one thing you should do more of? Why don’t you? Is it to do regular exercise, weekly budgeting, retirement planning, investment evaluation, losing weight? Whatever it is, it’s not about the thing, it’s about self-discipline. To tackle exercise compliance therefore is to tackle self-discipline. It is often said that the best innovation comes not from thinking “outside of the box”, but from thinking “Inside a different box”. So let’s leave exercise and examine what other industries do to instill and create self-discipline. Financial: ‘Too much month, not enough money’? (Michael Heppel). What is the first recommendation of any financial advisor when someone is having trouble making ends meet? Write down and record everything you spend. Then write down a budget and stick to it and record what you spend. Weight Loss: You’ve seen the programmes of people who have been clinically obese for years. First they begin by recording everything they eat. Then they measure and write down their key stats, then they set a diet/lifestyle plan and as they begin they monitor and write down what they did and how they progress. School Homework: My youngest daughter has a reading diary. Her school expects her to read something every day and then write down what she read with comments from a parent. In her mind, it is not an option for her to arrive at school without her teacher being able to see she has read something – even if that means reading in the car on the way to school! The pattern is emerging and it isn’t rocket science. What about exercise? Olympic athletes: They write down and plan every training session and write down what they actually did in that training session. It is impossible to reach that level without planning and recording. Gym-goers: There are gym goers who arrive with a diary. They have planned their exercise and they tick off what they do as they go around the different cardio and strength stations. Whenever I do this myself, my workouts are 100% more effective … and fulfilling. My principal interest is helping chronic back pain patients who have IDD Therapy Spinal Decompression treatment progress through their rehabilitation exercises. However, this works for any patient who NEEDS to be doing exercise for rehabilitation. Pocket Diary: Patients should use a simple pocket diary to record their activity. 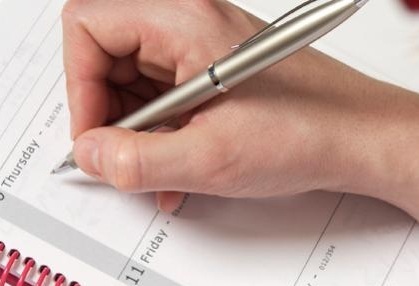 GOAL: On the first page they should write down their goal, strictly with a timeframe but that can be difficult for certain patients and there is a balance of compliance and unrealistic patient expectation. PLAN 1: Give your patient the exercises they need to perform and give each exercise a short name. The patient will write down short names for each exercise they are going to perform in their diary. It is important that THEY write them in THEIR diary to hardwire their brain into the process. PLAN 2: You should help them plan their first month of when and how many of each exercise they are going to do (this can include a walk to the shop to buy the paper). Here you will identify the time slots when it is feasible for them to actually fit the exercise in. Yes, we can all make time, but collecting kids from a swimming lesson or going to the pub with a friend creates excuse opportunities. HABIT: It is well documented that it takes 30 days to form a habit. You need to hold their hand for that first month. By setting achievable targets they are more likely to be able to ACCOMPLISH the targets. That brings personal reward, fulfilment, belief and … self-discipline. RECORD: Patient is going to write down EVERY activity they did and every exercise they did. They have to write it down in their diary. Exercise is self-discipline and comes from within. If they need to get a buddy or partner involved, or even a personal trainer to help them, great, whatever works. The killer point about the diary is the need to please others, ie you and not to lose face. They have a written down plan and they have made a personal commitment to you and themself, verbally. Tell them you want to see them in two weeks (or a month) and ask them to bring their (homework) diary. You are holding them accountable and the inky plan on the pages of their diary is far more likely to hold them accountable to their activity than an idea floating in their head, some scribbles on a piece of paper or an exercise video sitting in their inbox. You can get some branded pocket diaries very cheaply, or just have plain ones. The cost is minimal so as a “value added service”, you can just give the diary to your patient or sell them at cost/ small profit. Doing anything is always better than nothing. The diary helps instill the self-discipline to do what is required to help resolve chronic back pain. Off the vicious and onto the virtuous circle. To receive a document which explains to patients the purposes of using the diary as part of your compliance process, complete the form below. [contact-form-7 404 "Not Found"] . FAR Infrared: The Reinvention of FAR Infrared (FIR) Therapy as a Clinical Modality to Help Relieve Pain, Assist Rehabilitation and Aid Healing. This article is intended to raise awareness of the clinical benefits of heat therapy and to improve understanding of the growing evidence supporting the non-thermal effects and benefits of FAR infrared (FIR) therapy. Use of heat as part of physical therapy treatment is not common because heating product applications have tended to be cumbersome, time-consuming to apply and carry the risk of causing burns. Whether boiling gel packs straight from a hydrocollator or a wheat bag from the microwave, the impracticality of heat has meant that in practical terms, it is rarely used. Thermal therapy is largely ignored by western mainstream manual therapy professions and there is very little awareness of the clinical application and effects of FAR infrared for pain relief and as an aid to healing. Heat, notably moist heat, is used primarily to provide comfort and ease chronic pain and stiffness. Evidence shows that heat can increase the extensibility of soft tissues and thus aid mobility. FAR infrared is a resonant energy and was traditionally applied for a variety of conditions using an infrared lamp. The lamps went out of vogue because of the awkward application, the risk of skin drying from the visible light component of some of the bulbs and the potential risk of eye damage. A new generation of carbon fabric infrared elements is rapidly emerging which deliver heat quickly and conveniently from a safe FAR infrared heat source which can be moulded to the joint or easily applied to the painful area. The new carbon fabric infrared elements are used predominantly in the markets where they are made, namely Asia. Scientific research to understand the mechanisms which drive observed clinical outcomes of FAR infrared therapy, for a variety of conditions, is thus centred in China and Taiwan. The evidence-base for heat therapy and FIR therapy is diverse and compelling. There is significant growth in scientific interest in the non-thermal effects of FIR therapy itself, whilst the convenience of the carbon fabric heat element enables clinicians interested in the benefits of thermal therapy, to have a tool which they can practicably use to help patients. I have collated studies and papers and experiments to highlight the diversity of questions and depth of analysis about the thermal and non-thermal effects of FIR energy and the benefits of using heat to relieve pain. Click here to see INFRARED EVIDENCE. FAR Infrared treatment leads to a 57% decrease in pain for patients with 6 year chronic low back pain. Forty patients with chronic low back pain of over six years’ duration. Mean NRS scores in the FIR treatment group fell from 6.9 of 10 to 3 of 10 at the end of the study. The mean NRS in the placebo group fell from 7.4 of 10 to 6 of 10. The FIR therapy unit used was demonstrated to be effective in reducing chronic low back pain and no adverse effects were observed. It is my intent that you will be able to connect insights from the different studies and articles to raise your own questions to develop new hypotheses regarding the use and application of FAR Infrared Therapy to manage pain and assist injury rehabilitation. FAR infrared provides a safe, non-invasive, cost-effective therapeutic modality which is easy to administer. I have witnessed and heard countless anecdotal public and clinical examples of how patients with a variety of chronic conditions have experienced pain relief over-and above what they have been able to receive from standard moist heat, cold therapy, electrotherapy or indeed pharmacological treatments. That is not evidenced-based, however such a wealth of comments and observations begs many profound questions to clearly understand and explain the reported outcomes. I have no doubt that the new FAR infrared technology will have wide reaching accepted applications in a variety of fields as awareness and scientific research into the benefits of FAR infrared expands. One might go so far as to imagine the time when GPs will prescribe FAR infrared as a therapeutic modality in the place of medication, for certain conditions. If you are interested in using Infrared in your clinic or would like more details, please use the form below to request an information pack. This article examines the physics and mechanics of how IDD Therapy Spinal Decompression is able to distract and mobilise specfic segments of the spine and thus decompress a targeted intervertebral disc. Traditional traction has been outmoded for a number of years and one of the shortcomings of traction was the inability to focus and control forces at specifc spinal levels. IDD Therapy treatment is applied by distracting and mobilising targeted spinal segments at precisely measured angles, using high distraction forces which incorporate joint mobilisation in a longitudinal plane. Controlled forces are high enough to comfortably stretch the paraspinal tissues, open and create pressure differentials in the disc space and are applied for sufficient time to have a therapeutic effect. Ergonomic pelvic and thoracic harnesses secure the patient to the bed and a computer controlled cyclic distraction force is applied. Treatment is delivered by CE & FDA cleared Class II SPINA devices. All aspects of treatment and outcomes are recorded as part of a commitment to evidence-based medicine. Decompression of a Targeted Spinal Segment. In order to decompress a targeted level, engineers applied the principles of vector forces from physics to the spine. They observed that by focussing a controlled distraction force at a specific angle, they could open targeted spinal segments by between 5mm -7mm1. 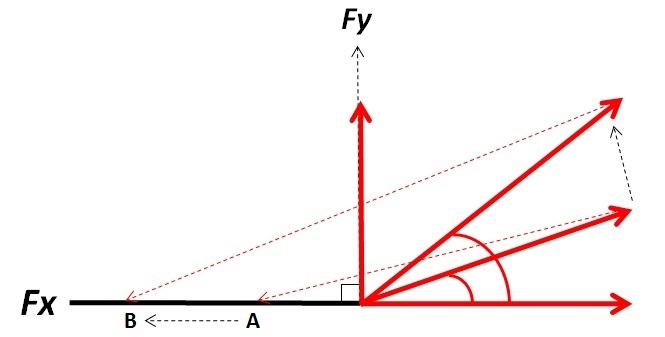 As the angle which a pulling force makes with the horizontal increases, the component of force in the horizontal direction (Fx) decreases and the vertical component of force (Fy) increases. This causes the relative direction of the pulling force to change and therefore the focus point of application of the pulling force to move progressively along the x-axis. 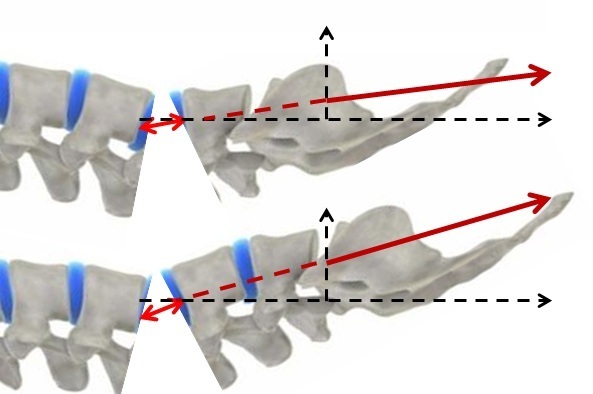 Measured changes in the angle of applied pulling force enable clinicians to focus and direct distraction forces accurately to injured spinal segments. Sinusoidal distraction force: This patented waveform replaces linear pulling forces allowing greater comfort and application of higher distraction forces of up to half body weight plus 5-10kgs. Longer treatment duration: Twenty-five minute treatment during which time joints are distracted for 13 times to a high tension, whilst soft tissues are worked and remain under constant tension. Joint Mobilisation: The sinusoidal waveform allows for the application of oscillatory forces to mobilise the joint in a longitudinal, rather than anterior-posterior plane at the point when the joint is distracted. The sum of the parts: Improved harnessing secures the pelvis, measured angle of distraction, computer controlled sinusoidal waveform, cyclical distraction and patient remains completely relaxed for 25 minutes. In order to decompress (take pressure off) a joint, it is necessary to distract it in the opposite direction to the compressive force. Where a joint has become stiff and immobile, gentle mobilisation at the point of distraction helps to improve mobility in the joint and allow the natural mechanisms which keep joints healthy to operate freely. IDD Therapy Spinal Decompression applies new technology to physical laws to enable clinicians to distract and mobilise targeted spinal segments as part of a complete programme of care, including manual therapy and exercise rehabilitation.